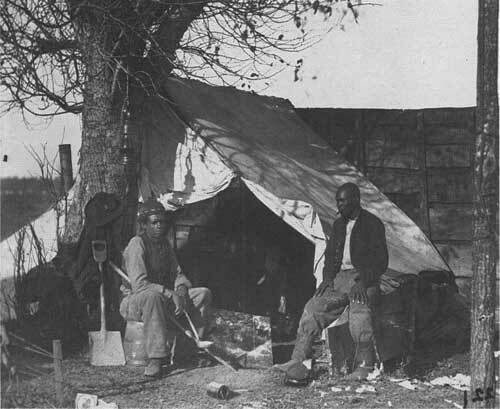 As Union armies penetrated deeper into the South, liberating more and more blacks from the yoke of slavery, authorities began to employ these laborers for Federal benefit. For more than two centuries they had produced bountiful crops and goods for slaveholders; surely these freed man and women could direct their efforts on behalf of the Union war effort. Government officials placed woman, children, and elderly and unfit men to work on abandoned plantations to raise cotton and foodstuffs. Able-bodied males labored for the army, performing a variety of support duties which freed more soldiers for combat. The demands of large-scale war were pushing the Lincoln administration steadily toward black military service. Precedent supported their admission into the armed forces. In the American Revolution, black soldiers had fought valiantly in the Continental army. George Washington reluctantly accepted them into his army only with the proviso that all who entered military service received their freedom. During the War of 1812, men of African descent fought most conspicuously alongside Andrew Jackson at the Battle of New Orleans. Only in the war with Mexico, which demanded limited numbers of troops, did the government officially bar black Americans from the ranks. More important, black men had already secured entry into the United States Navy. Although official figures are difficult to ascertain, perhaps 20,000 to 30,000 African Americans actually joined the navy. During the war black sailors manned ships in the blockade and fought on numerous occasions in river operations. None appear to have received commissions as officers. Still, they served in every capacity on the enlisted level with distinction. Four black sailors received Medals of Honor, and Robert Smalls, who seized control of a vessel and piloted it out of Charleston Harbor, became a national hero for his exploits. Yet this was predominantly a ground war, and it was in the army that black men had to make their mark. No one was more aware of that fact than Frederick Douglass. His editorials harangued the Lincoln administration for its unwillingness to admit African Americans into the Federal army. "Colored men were good enough to fight under Washington," Douglass scolded the president. "They are not good enough to fight under McClellan. They were good enough to fight under Andrew Jackson. They are not good enough to fight under Gen. Halleck. They were good enough to help win American independence, but they are not good enough to help preserve that independence against treason and rebellion." On the battlefield alone, Douglass acknowledged, could black people secure the full and equal rights they sought. "Once let the black man get upon his person the brass letters, U.S., let him get an eagle on his button, and a musket on his shoulder and bullets in his pocket," he predicted, "and there is no power on earth which can deny that he has earned the right of citizenship in the United States." During the first fifteen months of the war, Lincoln certainly had opportunities to permit black men to serve in the army. Manpower shortages and abolitionist sympathies convinced several general officers to advocate black enlistment, and a few of them actually overstepped their authority and organized military units composed of African Americans. Each time, the Lincoln administration rebuffed these efforts. The first scheme to arm black men occurred along the coastal islands of South Carolina. When Acting Secretary of War Thomas A. Scott ordered Brigadier General Thomas W. Sherman to head an expedition to seize the area, he authorized Sherman to use the services of anyone, "fugitives from labor or not, who offered it." He could employ them any way he saw fit, as long as this was not "a general arming" for military service. Sherman adhered strictly to the guidelines and did not use them for military purposes. His successor, however, did not hesitate to place an expansive spin on those instructions. In late March 1862, Major General David Hunter, a West Point graduate with antislavery leanings, succeeded Sherman to the command in South Carolina. Deriving his authority from the orders given to his predecessor, Hunter declared martial law and promptly emancipated all slaves in Georgia, South Carolina, and Florida. Hunter brought in escaped male slaves under gunpoint for a meeting. There he announced plans to organize military units with fugitive blacks and made clear that they were all volunteers. Such a harsh method of recruitment alienated the local black population. Hunter than worsened the situation by neglecting to inform the War Department of what he had done. The Lincoln administration learned of Hunter's activities through newspaper reports and Treasury Department correspondence. Eventually, Lincoln could have sustained Hunter. In the Militia Act of July 17, 1862, Congress empowered the president to organize African Americans and use them "for any military or naval service for which they may be found competent." Nevertheless, Lincoln elected not to endorse Hunter's decisions. He believed that black enlistment was a delicate issue, one that required careful planning and cautious execution. Hunter's unauthorized foray into policy-making smacked of poor timing and mismanagement. At the heart of the second scheme to create a black regiment was U.S. Senator Jim Lane, a diminutive yet tough-minded politician who concerned himself more with results than rules. In 1862, Lane resigned his seat to accept a commission as brigadier general, with the duty of recruiting military units back home in Kansas. 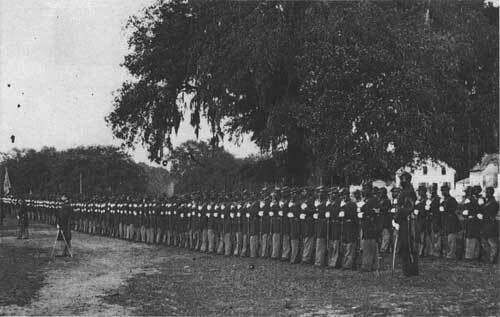 Among Lane's newly formed commands was a regiment of black soldiers. Although Lane lacked specific permission from the War Department to raise black units, he apparently hoped that his political influence and the actual existence of such a regiment would win governmental approval. He was wrong. Twice the War Department notified him that he had no authorization to raise a black regiment and must disband it immediately, and twice Lane simply ignored the order. In January 1863, the Federal government finally accepted the services of his black regiment, the 1st Kansas Volunteer Infantry (Colored). By then, though, many of its troops had already seen combat. Louisiana, too, was scene of a bizarre episode of black recruitment. After a joint army-navy expedition captured New Orleans in April 1862, Benjamin Butler assumed command of the occupation forces. In Virginia, Butler had acted boldly in the formation of his contraband policy. This time, when a subordinate demanded that he organize black men into regiments, Butler hesitated, and to the War Department he even voiced doubts about the utility of black soldiers. Brigadier General John W. Phelps, like Hunter a West Pointer and an abolitionist, regarded black enlistment as a military and social necessity. Blacks, Phelps argued, could offset the Federal manpower shortage in Louisiana, and the structure and discipline of military service would help to ease the transition from slavery to freedom once Southern society collapsed. Ha welcomed and aided fugitive slaves in their attempts to reach Union lines. Then, without authorization, he organized the freedmen into five companies and requested arms and accouterments for them. Butler, who had not yet learned of Phelps's activities, directed him to employ the fugitives to assist in the preparation of defensive works by cutting down trees and building fortifications. Phelps exploded in fury. He would order black soldiers to perform such labors, but he would not act as a "slave driver." Phelps then tendered his resignation and requested an immediate leave of absence. Only the president had the right to raise black military units, Butler explained, and at present Lincoln declined to exercise that authority. The fortifications were absolutely essential for their defense, and the use of fugitive slaves for their construction was standard practice. The government had drawn on black labor in other theaters, and the men would receive pay for their work. Butler then urged Phelps to withdraw his resignation. Butler's words failed to soothe his subordinate's ire. The government accepted Phelps's resignation. A bizarre twist concluded the Phelps controversy. Just a few weeks after he sent Phelps's resignation to Washington, Butler changed his mind on black soldiers. In the intervening time, he had received a letter from Secretary of the Treasury Salmon P. Chase. Conveying sentiments that Lincoln had expressed in a cabinet meeting, Chase suggested that the time was right for the formation of black regiments. Since Butler desperately needed manpower and had initiated the contraband policy, he was the logical person to enlist African Americans in the army first. Fortunately for Butler, he had the ideal recruits for the first black regiments in some local militiamen. 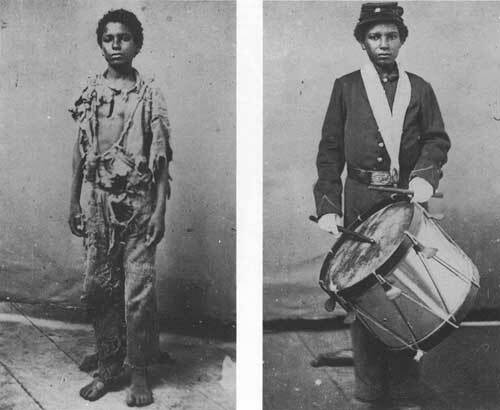 These were free blacks whose ancestors had fought in the Battle of New Orleans in 1815. They were men of considerable means, either skilled workers, professionals, or entrepreneurs. When hostilities broke out, they volunteered to serve for the Confederate government. With Federal occupation of New Orleans. they had immediately tendered their services to Butler. In May 1862, he declined their offer; three months later, fortified by Chase's recommendation, Butler accepted these free black militia men into the Union army, and the War Department promptly endorsed it. What made the decision to accept them into the army even more eventful was that Butler brought these militia units into Federal service with their black officers. At one time the 1st, 2nd, and 3rd Louisiana Native Guards (later 73rd, 74th, and 75th U.S. Colored Infantry) all had black captains and lieutenants and one regiment, the 2nd Louisiana Native Guards, had a black major, Francis Dumas. Shortly afterward, prominent abolitionist and Massachusetts infantry captain Thomas Wentworth Higginson received authorization to recruit the first black regiment from scratch. Higginson returned to the South Carolina coastal islands, where Hunter had alienated so many freedmen with his overbearing enlistment" methods, Painstakingly, Higginson won over the local black men and formed the 1st South Carolina (Union) Infantry (later 33rd U.S. Colored Infantry). 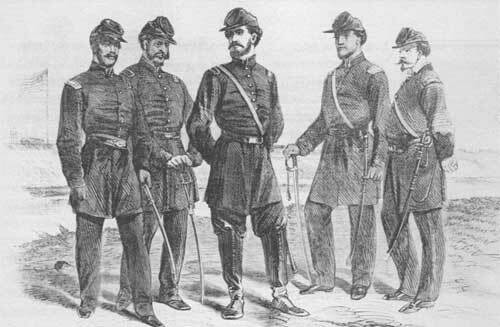 Unlike the Louisiana Native Guards, whites constituted the officer corps in the 1st South Carolina. 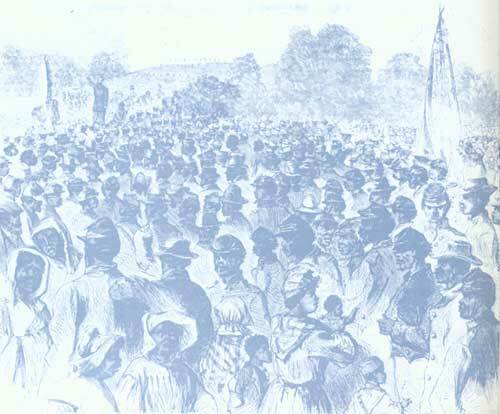 Within the first six months of 1863, recruitment of numerous black regiments was underway. The War Department finally accepted Lane's regiment for official military service, and conscientious efforts to form black units had progressed handsomely in Louisiana and Mississippi. To the north, Massachusetts governor John A. Andrew successfully lobbied the War Department for authorization to create a regiment composed of free blacks. Again, all the officers were white.